In case the name doesn’t give it away, G’day Casino is an Aussie themed venue, but it’s licensed offshore by Curaçao eGaming and the UK Gambling Commission. G’day offers a huge collection of casino titles from fair dinkum software developers like NetEnt, Microgaming, BetSoft and Evolution Gaming. 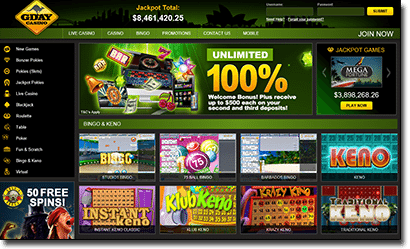 G’day Casino uses instant-play web based software which means no additional downloads are required to play keno here. This is great news for Mac users who have been shunned in the past due to casino software that was only compatible with PC’s, and is a sign of relief for users who don’t wish to take up any more space on their hard drive with unnecessary downloads. Given its browser-based nature, real money games at G’day can be accessed on any device using Chrome, Safari, Explorer or Firefox, not just on desktops and laptops but also smartphones and tablets. You’ll be welcomed at G’day Casino with one of the biggest welcome bonuses we’ve yet to see – how’s that for true blue Aussie hospitality?! Upon signing up and depositing funds to your account for the first time, the blokes at G’day Casino will reward you by matching your deposit by 100% up to an unlimited amount, which means you’ll get double your money right off the bat. If your first deposit is over $100, a free slab of beer will be delivered to your doorstep, so you can crack open a frosty one while kicking back and playing real money keno at home. You’ll continue to be rewarded with an extra 10% deposit bonus up to $50 for every deposit you make from thereon in, with daily bonuses available every day of the week like the Monday Blues Buster and Break the Bank Wednesdays. What keno games are available at G’day Casino? 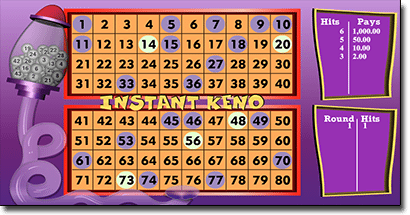 Keno – this NetEnt game is the stand out keno title at G’day, featuring bonus rounds and a jackpot displayed in the top right hand corner of the screen. It offers an auto-pick function and the option of choosing to play five or ten games with the hit of a button. The appearance of five or more jokers will activate the games bonus round. Instant Keno Classic – a basic 80 ball keno game from BetSoft, played over two boards of 40 numbers. Klub Keno – a fun take on the game which awards a 2X payout for any Star Ball wins. You can select to play one, five or ten games using the same numbers. Krazy Keno – a 40 ball keno game where you get to see the numbered balls whizz around before the winning picks are drawn. Traditional Keno – this is a classic 80 ball keno game designed to create a sophisticated flair, perfect for those who enjoy their casino games with a certain air of elegance. If you’re unfamiliar with any of these games, you can give them a try for free in demo mode so you can get a feel for the format before committing to risk any of your own money. G’day offers a great mobile casino, which just like the desktop site is available in browser mode, making it accessible for both iOS and Android users. However, although G’day Casino’s mobile site does offer a great selection of pokies and table games, unfortunately we’ve yet to see any keno games optimised for mobile play. As the demand for mobile gaming grows, we suspect it will be a short matter of time before keno games are available for smartphone and tablet users at G’day, so check back using your mobile device any time to stay up to date. The minimum amount you can deposit at any time is $20. Maximum deposits depend on the payment method of choice and whether you’ve been accepted for VIP status. All payments are protected by the sites 128 Bit SSL (Secure Socket Layer) digital encryption security, which scrambles your personal information so that your details can’t be intercepted by another person.